Miroku is the character from Inuyasha who loves women more than anything else. Or at least it seems that way. But underneath everything Miroku seems to be, he’s a good guy with a good heart. And he does care about Sango. Which he proves throughout the Anime show as you get deeper into it. Let’s get into these 2 Miroku Quotes From Inuyasha That Prove He Has A Good Heart! I love this quote. Why? Because it shows how much he cares. And how genuine his words are. In life the last thing you’d want is to NOT be able to protect those you care about. If it ever comes to a point where you’d have to protect them from danger. And not being able to do that is saddening. That’s what makes Miroku’s quote so relatable. Life is frightening because where there’s life, there is also death. Life only lasts for so long. We only get so much time to do the things we want. Sometimes life’s challenges aren’t easy, and sometimes it’s overwhelming. That’s why it’s important to not only look on the bright side of life, but to do everything you want to do while you still can. 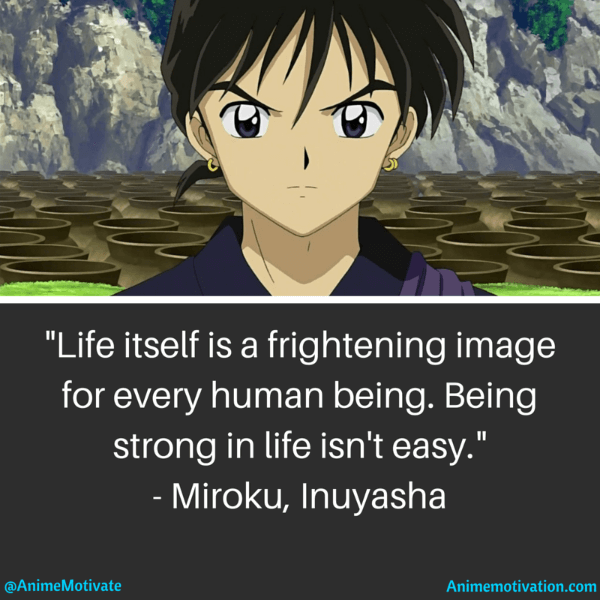 What do you think of these 2 quotes by Miroku? Do you have any Inuyasha quotes you’d like to suggest? Share your thoughts and follow Anime Motivation on Facebook.